Arts Law : What is copyright? Copyright is a bundle of rights which visual artists, musicians, writers and video and film makers own in relation to their work. It exists in every kind of creative work you can imagine. Other people need your permission to do any of these things, even if they have bought or own the original work. This is because copyright ownership is different from ownership of the physical work you created. For example, if you create an oil painting on canvas, the physical work is the canvas with the oil paint you used. You own it until you have sold it or given it to someone else. Once you have done that, you do not have ownership of the physical painting but you still own copyright in relation to the image you painted. For someone to use your work, you must first give them your permission. When you give permission to use your work, you should use a written licence. If a theatre director wants to use your painting for the set of a play, or a composer asks to use your poem for a song you would ask them to draft a license or contract. You can learn more about this in the What is a Contract? section. A copyright infringement is when someone does not ask your permission before using, changing or showing your work for the first time. Learn how to protect yourself against a copyright infringement in Taking action: what are the legal steps? 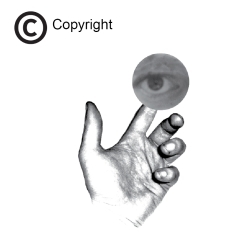 Copyright automatically gives you, the creator of a work, legal protection and is free. © is the symbol used to show copyright. It shows that your work is protected. Write it by putting a circle around a ‘c’. Copyright lasts for your lifetime and up to 70 years after your death. Nobody can use or change your work, unless you say they can. If you say that someone can use your work, or if someone says you can use their work, it is best to make a contract in writing. No one is allowed to use your work without your permission. If someone uses your work without your permission, this is called copyright infringement. The law gives you protection if your copyright is infringed. Keep drafts, photos, sketches or notes about your work. These are proof of you creating your work. Example: © Name Surname 2010. A visual artist would put this on the back of an artwork. A film maker would put this in the end-credits of a film. A musician would put this on a CD. If someone has infringed your copyright, take action straight away. Learn more about these resources developed with Arts Access Victoria. "Copyright protects you and your work"